’Tis the Season for Graduation! Home Columns ’Tis the Season for Graduation! “As the symbol of your graduation, you may now turn your tassel from right to left,” announces the school official. It signifies a turn of new beginnings with a new perspective in life. It is also a time for endings, such as the end of the school year. Graduation marks a milestone from Preschoolers to kindergarten. Elementary to middle school. Middle school to high school. And from high school to college. Graduation is a time to celebrate the accomplishments of another chapter in life that has created many moments into lifelong memories. It’s a joyous time for family and friends to gather together to show how proud they are of what the graduates have accomplished. If you have attended a graduation recently, surely, you have noticed that everyone is wearing the same outfit. A black polyester gown is not your normal everyday clothing. So what’s up with the funny hats and tassels—what’s that all about? Those hats are called “Mortarboards” because they resemble a tool used by bricklayers to hold mortar. In some universities, they are referred to as Academic Hats, also known as “Oxford Caps.” The cap is made of a flat, square board attached to a skullcap and a tassel, buttoned at the center. Traditionally, the caps are paired with a gown, also known by others as a robe to complete the graduation attire, the “cap and gown.” Based on research and history, the cap and gown is traced to the academic and clerical dress commonly worn at the medieval universities of Europe. These early universities didn’t have buildings, so students would usually meet at churches. Because those churches were not temperature controlled, history tells us that students wore long gowns and caps to keep them warm. Danielle Soriano from Preschool, Elementary, High School, and College. Now that we’ve got your attention … if you are curious about the tassels that hang from those funny Oxford Hats, often times, the color of the tassel matches the school colors. Special colors are used to represent specific degrees, subject areas, or achievements. It has become a tradition at many schools for all graduates to wear the tassel on one side until receiving their diplomas. After the graduating class is announced, the students then switch the tassels from right to left. But wait a minute, it is not over until the graduates also toss their caps into the air to celebrate. It is documented that hat-tossing started in Annapolis, Maryland in 1912. That year, students at the U.S. Naval Academy became officers for the first time and instead of having to serve two more years, they freely flung their hats into the air to spontaneously celebrate. Since then, the tradition continues each year, and it has become a custom at every university, high school, and even elementary schools worldwide. 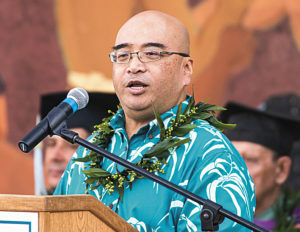 chef2: Honored Guest Speaker, Sen. Gil Keith-Agaran delivers Commencement Message to the UHMC’s Graduating Class of 2017. 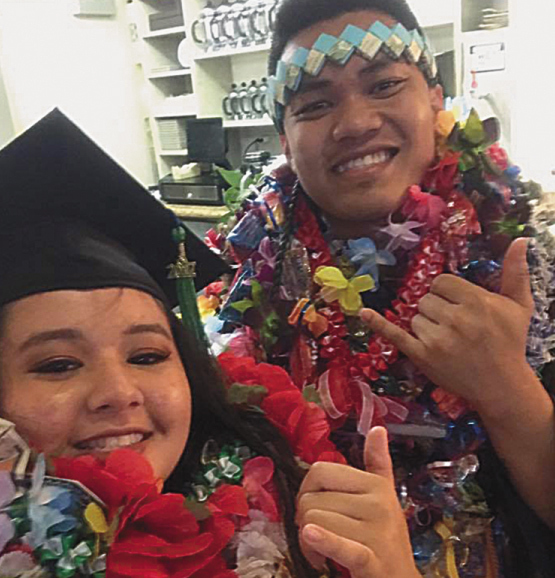 In this issue, we feature graduate Danielle Soriano, Class of 2017, Culinary Arts Program, University of Hawai‘i, Maui College. Here is a dialogue of a Q&A interview between myself (Chef Jake) and Danielle Soriano. CJ: Tell us a little bit about yourself. Who are your parents? Any siblings? DS: My parents are Vanessa and Jayar Mangiduyos of Lahaina. I am the oldest of three. I have one sister, and one brother. CJ: Were you born here? If not, how long ago or how old were you when you moved to Maui? DS: I was born and raised in the Philippines, and moved to Maui in 2014 when I was 15 years old. CJ: Growing up, what were your dreams and aspirations? DS: I grew up in a family where cooking and eating is how we bonded. I’ve always enjoyed reading cookbooks and cooking with my grandmother at a very young age. She’s my inspiration to take up Culinary Arts as my major. CJ: Do you have a special academic achievement you’d like to celebrate? DS: Yes, I have received several scholarships while in College. My team and I, won Gold in a competition in my Cap Stone class, Garde Manger. I am also a recipient and awarded the ‘Aipono’s Exemplary Graduate Award held in April at the Hyatt Regency, Kä‘anapali. CJ: Would you mind sharing the winning recipe? DS: Not at all Chef! Here you go! 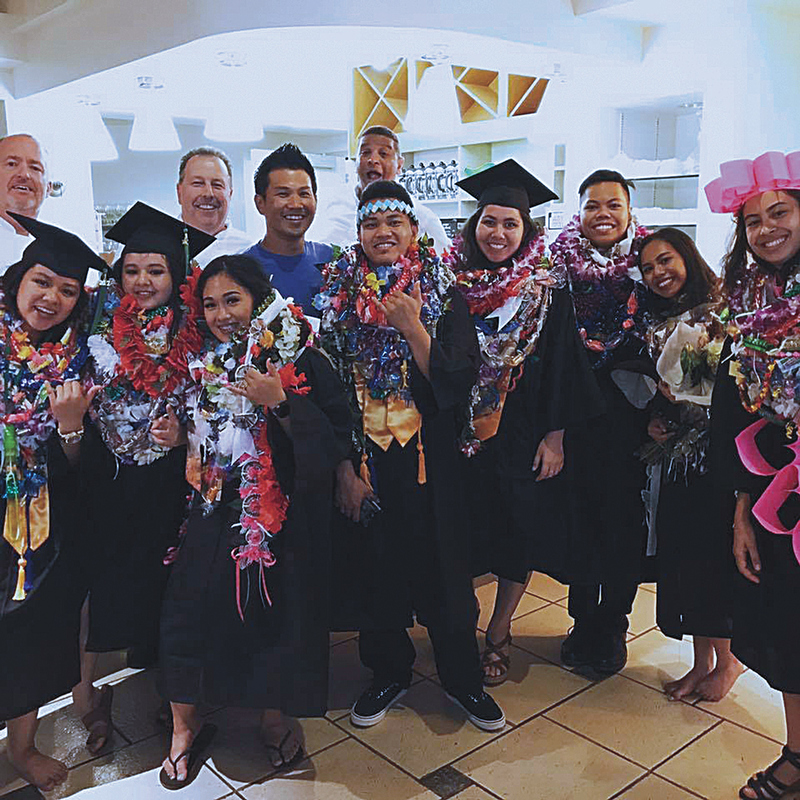 chef3: Danielle Soriano celebrates with Staff, Faculty, and 2017 Graduates at UHMC Culinary Arts Program. Season scallops with S&P and then sear. Danielle Soriano poses for a shot with her employer Chef Jojo Vasquez of the Plantation House Restaurant at Kapalua, proud winner of the coveted 2017 “Chef of the Year” Award, presented by Maui Nō Ka ‘Oi Magazine. CJ: Are you currently working? DS: Yes Chef! I am currently working at The Plantation House Restaurant, Kapalua under Chef Jojo Vasquez, Chef of the year 2017, Maui Nö Ka ‘Oi Magazine’s ‘Aipono Awards. I will also continue to be a Teaching Assistant under the professional training of Mark Malone at the Leis Family Class Act Restaurant for Dining Room Service. CJ: What are your plans now that you have graduated from College? DS: I will continue to learn and gain more experiences by working in restaurants and with different chefs. CJ: Any long term goals you would like to share? 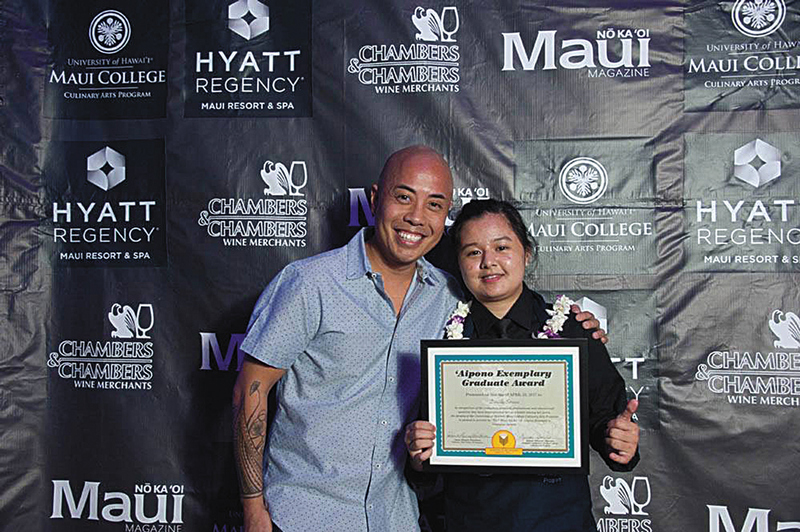 Pictured here is Danielle with Outstanding Culinary Student Awardee, and Maui Filipino Chamber of Commerce 2016 Scholarship Recipient, Jayford Agbayani. DS: As for long term goals… while in school, I found the love in working in the Front of the House as well. I also enjoyed working in numerous Food Events, so I also plan to work in different upcoming events island wide. I intend to immerse myself in learning the “How to’s” in organizing events. One thing that also sparks my interest while gaining more experiences is I would also want to take part in the Filipino Food Movement. 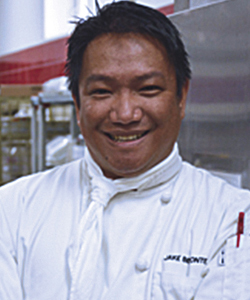 It’s a movement where Filipino Chefs promote Filipino Cuisine in all of its forms. We re-create and give Filipino Food an elevated and innovative approach, and give it a whole new inspired interpretation. It’s fun and of course, always delectable! CJ: What is the most valuable lesson you have learned as a college student? Or any word of advice to the next generation of graduates? DS: As a college student, I’ve learned to go out of my comfort zone and I think that’s where you’ll start to learn more. And always give your best in everything that you do and be humble. Keep learning, keep reading, keep growing, and definitely, keep on cooking and dining to see what else is out there. It’s a non-stop learning!